I'm okay with escalating punishments, and am not a fan of Hope Solo's comments after the Sweden game. That said, I think that six months' suspension for essentially talking smack is absurd - and that it's not a coincidence that this suspension is happening at a time that the USWNT has no important games happening. Are they scrambling to find a long-term keeper solution? Probably. But they've given themselves a lot of wiggle room by giving a superficially-onerous punishment, in a timeframe where Solo's absence would not risk any qualification / competitive games. I agree with all of this, although I don't have a problem with the six month thing given her history and the distinct possibility that she has gotten into other trouble that we don't know about but US Soccer does. I would expect if this was the first incident, if Mallory Pugh had said these things, she would have gotten a slap on the wrist, and I'm totally fine with that. Man! This next round of WC2018 qualifiers is already upon us! I have updated them with their times now, and added in the next round of friendlies for both squads. Kind of an awkward time this Friday with the game during the afternoon. I hope I can tune in for it. Since its on beIN sports, I'd need to utilize reddit soccer streams. I have Fri off. Sounds perfect. Well, we won big today! Nice job by Pulisic to score a brace in a small amount of time. Nice to see Pulisic do well, and also RBNY's Sacha Kljestan. Funny thing, at least one commenter on the blog where I followed the game (from work) called the US performance "very poor" and said "if you play this way against Trinidad and Tobago will lose the game". The improvisational nature of our lineups (today featuring yet another starting XI who had never all played together) is very evident defensively, but I love to see our veterans working hard to get Pulisic on the ball. I'm still not sure how his shot managed to stay out, by the way. GOOOOOOOOOOOOOOOOOAL! Sweet shot by Jozy! Pulisic has looked great imho. He's earning that number 10, linking up with everyone he can. Keep him starting as long as possible. Morris just subbed on. Good to see Omar in the lineup, btw. Holy shnikes, another Altidore goal before I finished this post! Still not convinced by Jozy. I like the kid, he puts himself about and can work hard, but can often drift out of games, and struggles to create chances against better defenses. Not sure who I'd want up front in his place though (Wood is better IMO but I like him better as a shadow striker than leading the line, from the admittedly little I've seen of him). None of the guys who have scored tonight were with the squad for Copa America. Edit: Well, I feel certain the announcer said the fourth goal was by Morris, but it was Arriola. I was thinking Morris had really changed his looks and tamed his curly hair! Great steal and AMAZING pass by Pulisic to Altidore just now, but the shot went off-target. US Women play Thailand tonight! 8pm Eastern, ESPN2. Edit: Also updated the OP with the rest of the announced matches for this year. The big games, of course, are our first two matches in "The Hex", the final round of World Cup Qualifying for the MNT. We start on November 11 with our arch-rival Mexico. Good game to see at an American Outlaws watch party. It's game day! USA vs Cuba is four hours away! Not looking impressive against New Zealand. Also, announcers mentioned that Darlington Nagbe asked to be left out of these friendlies. With the hexagonal starting next month with a critical game against Mexico, that may effectively be telling Klinsmann to drop him for that one as well. I wasn't able to watch because of a work event. Did I read that Yedlin played higher up? How was that? I'm very surprised that Klinsmann would want to mess with that back line, but I understand that he was evaluating different guys in this game. It's game day! 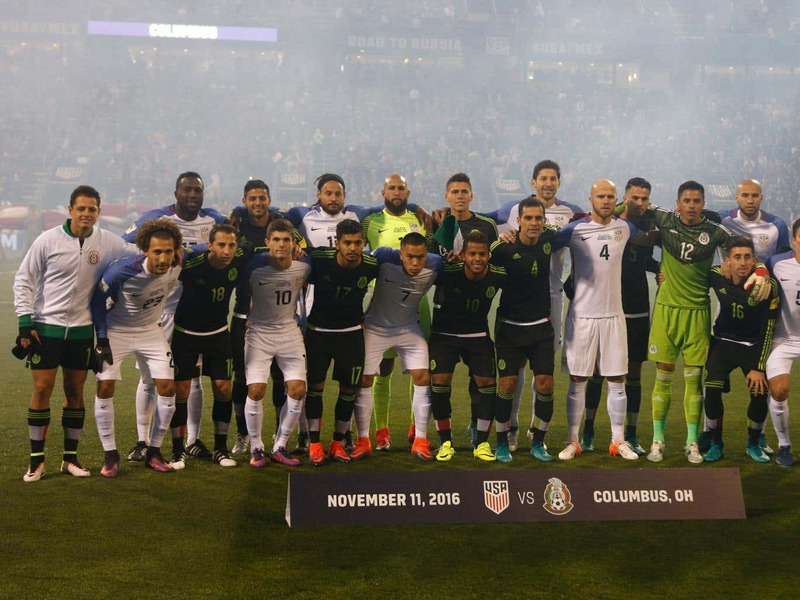 USA - Mexico in Columbus! Final round of World Cup Qualification! Looking forward to it, but pleasePleasePLEASE Columbus crowd, no idiotic wall chants or any of that crap. Stick to the action on the pitch, which is charged enough already with these teams. Every big American Outlaws gathering I've been to has been an extremely multi-cultural, welcoming affair. I may be biased by location, but there are tons and tons of Latino Outlaws in Houston. They're often the loudest. Agree 100%. No concerns regarding the Outlaws ! I am looking forward to a dignified and respectful DOS A CERO. Ugh. Mexico scores first, and now Tim Howard goes down without contact. Come on, Tim! I've been seeing their tweets for days. I deeply appreciate their non-partisan call for respect this week. I have to wonder whether both sides will finish with 11 players. Good call, since they didn't, although it was so late it didn't matter. Clever gamesmanship by the Mexicans towards the end. What a damn gut punch that 89th minute goal was on what I think was their only corner kick the entire game. Barf. Rough way to end the game, especially the way the US played the majority of the second half. That said, it can be argued that it was fair recompense for the posts that Mexico hit in the first half. Entertaining game and 1-1 felt like the just outcome. Oh well. Game day again! USA at Costa Rica. After dropping that game on Friday, we really need to get a result here. Hopefully we won't see any more novelty formations from Klinsmann. Just heard in the Guardian podcast that he tried a 3-5-2 or 3-4-3. That's pretty risky, especially if he didn't test it beforehand. Yeah, a 3-5-2 imho, trying to shore up our midfield, I reckon. We didn't score until we switched to a 4-4-2. Pulisic and Wood were great, and are real bright spots for the future. I don't know what's going on with Darlington Mage right now - supposedly he's had some contract disagreement with US Soccer. Also, I just found out that tonight's game will be in BeIn Sports, a channel I've never gotten despite going through three different cable providers. Reddit Soccer Streams will be critical for be tonight.